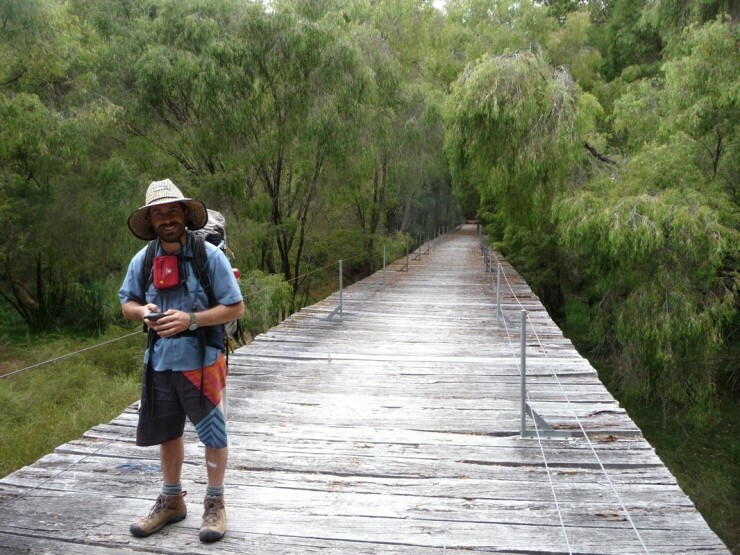 Simon was yearning to pull out his dorkiest hiking outfit and we needed to do some reconnaissance for an upcoming tour, so last week we set off to walk the section of the Bibbulmun Track between Pemberton and Northcliffe. The last time we walked this section in its entirety was in 2008 when we were doing our end to end – eight weeks and about 1000km walking between Perth and Albany in Western Australia. To be honest, I didn’t remember all that much about it. I remembered that we met a bunch of noisy school boys along the way, that we swam in Blackberry Pool and that, for nearly the whole time, we were surrounded by trees – glorious trees! 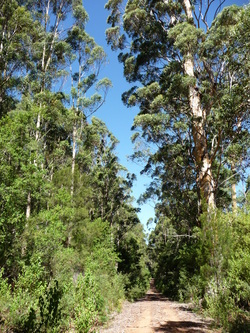 Karri trees (Eucalyptus diversicolor) are the third tallest tree in the world, after the Coast Redwood (Sequoia sepervirens) and Mountain Ash (Eucalyptus regnans), and they dominate this section of track. Apparently, they are named ‘diversicolor’ because their leaves are dark on the top and light underneath. This is certainly true but the most striking feature of a karri, apart from its enormous size, is its beautiful multicoloured bark. I have a theory, that back in the day, when Western Australia was first settled by Europeans, and we were sending samples of plants along with suggested names back to the ‘mother country’ at a rate of knots, the name Eucalyptus diversicolour was suggested by a keen back yard botanist. They were perhaps living in the Augusta area – where these giant trees were proving to be a daunting obstacle between the new settlers and their livelihoods. This person may have sent a description of the karri tree, along with a sample of the seed pods and some leaves back to England to be officially classified. The office clerk at the royal British botanical library, or wherever these things get classified, was busy compiling volumes of plant classifications from the new country. He saw the seed capsule – “yes, the well covered capsule does indicate a eucalypt” – and he saw the leaf – “oh look at that, two colours”. But in a rush the office clerk didn’t read the description of the most beautiful and unusual bark of the karri. Changing throughout the year, the karriâ€™s trunk ranges from the rough grey of a hardy forest dweller to the smooth and pale skin of a powdered geisha girl; transitioning, as it sheds its roughage in great strips of grey bark, through a delicate coloured surface worthy of the finest Tasmanian salmon.